It’s the time of year where almost everyone is making or buying peanut butter eggs. Only those with extreme will-power or those who know how horrible sugar is to our health can say no to peanut butter eggs. I was feeling left out, so I decided to make some, the real food way of course. 🙂 So, here’s my recipe! Let me just say that the recipe is not perfect. My peanut butter was a little runny, too runny to shape anyways as you can see from the picture. Perhaps adding more arrowroot powder would help that. 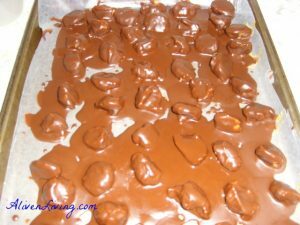 As with any candy recipe I make, you can see my lack of patience with dipping and dripping. lol. Maybe your finished eggs will look nicer than mine did. This recipe uses a lot less sugar than the standard peanut butter egg recipe. That was my goal. So, don’t feel bad about enjoying these peanut butter eggs! 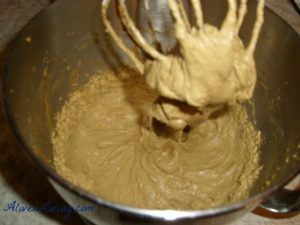 In a small bowl, cream the butter, peanut butter, and cream cheese until smooth. In a food processor, process rapadura until mostly in powdered form. Add arrowroot powder and process until mixed together. Gradually beat the rapadura mixture into the butter mixture. Mix on high speed until it is creamy with no lumps. Drop by tablespoons onto a waxed paper-lined baking sheet; form into egg shapes. Freeze for at least 10 minutes. 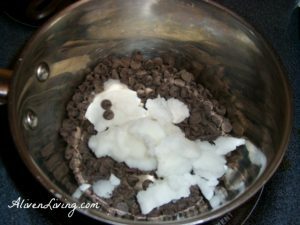 In a small saucepan, melt chocolate chips and coconut oil; stir until smooth. Remove from heat. Dip eggs into chocolate mixture; allow excess to drip off. Return to the baking sheet. Let stand until set. Store in an airtight container. (I put mine in the freezer.) Yield: 3 dozen. 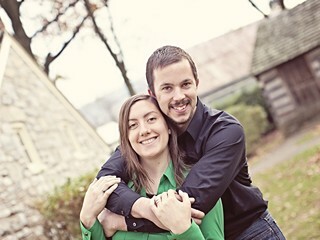 My name is Beverly and I am blessed to be the wife of Rodney, a godly man. We are Bible-believing Christians with a desire to follow God’s plan for our lives. © 2017 - Alive & Living - All Rights Reserved.